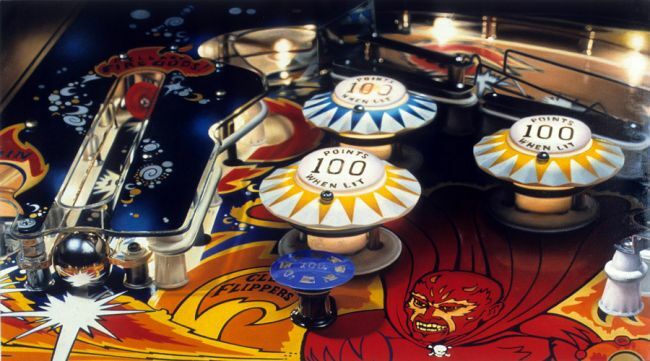 There are many ways you can score 100. Perhaps that math test you aced at school or that perfect art project that stood out from your peers and earned you the perfect score. There are loads of wines that have received the coveted 100 from both Wine Spectator and Wine Advocate and have gone on to be massively sought after in the market at extremely high prices. My most memorable “100” was batting for almost 3 hours against the Edmonton Masters at Victoria park in 2010, eventually dismissed LBW for exactly 100 runs. (for obscure cricket references some Googling may be required for clarification). 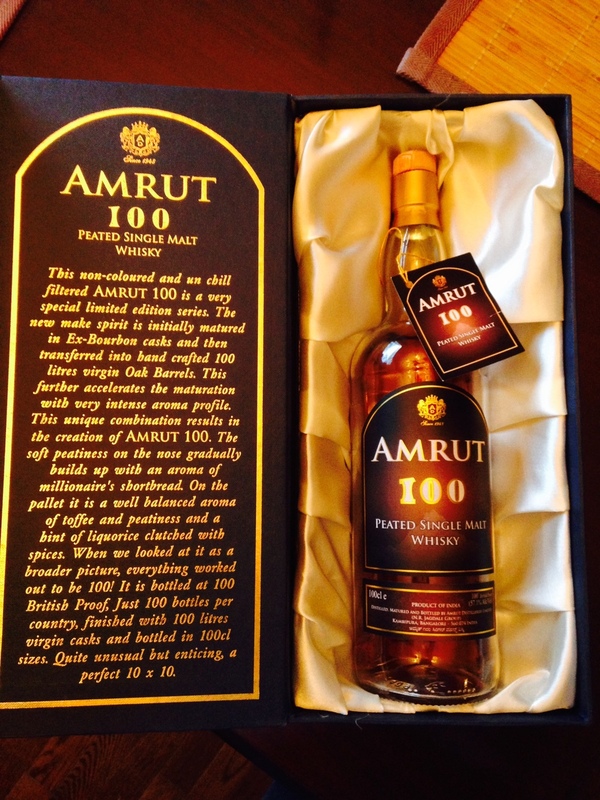 That same year I was given a bottle of Amrut 100 by their international brand ambassador Ashok Chokalingham. A treasured possession, I rarely bring it out, however as promised this delicious whisky is one of my Winter Series reviews promised way back in Blog number #27. 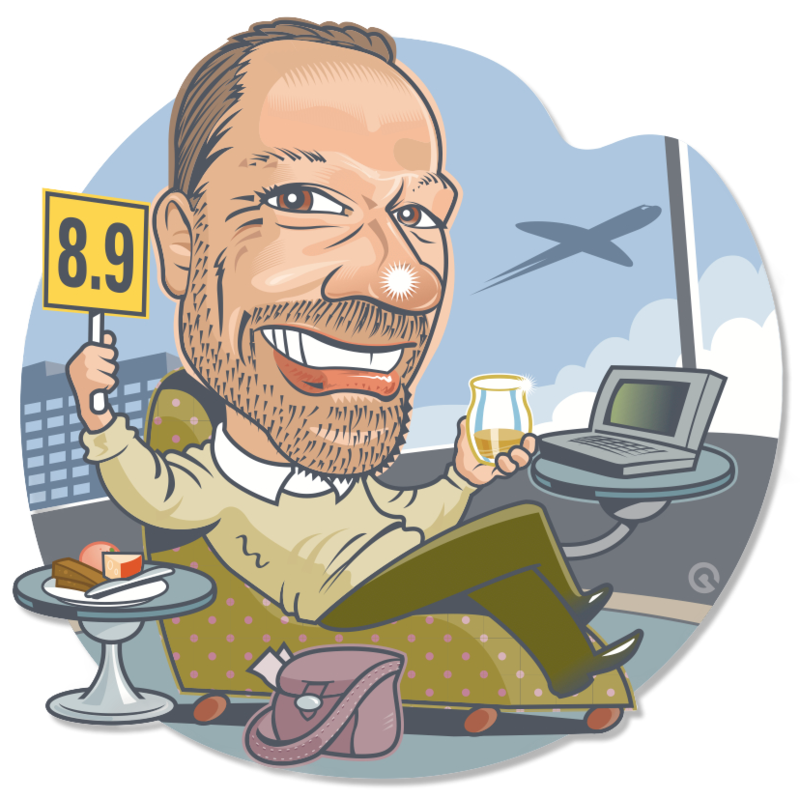 There are very few whisky writers that use the 100 point system and as yet there have been no “perfect” whiskies for consumers to go crazy over. 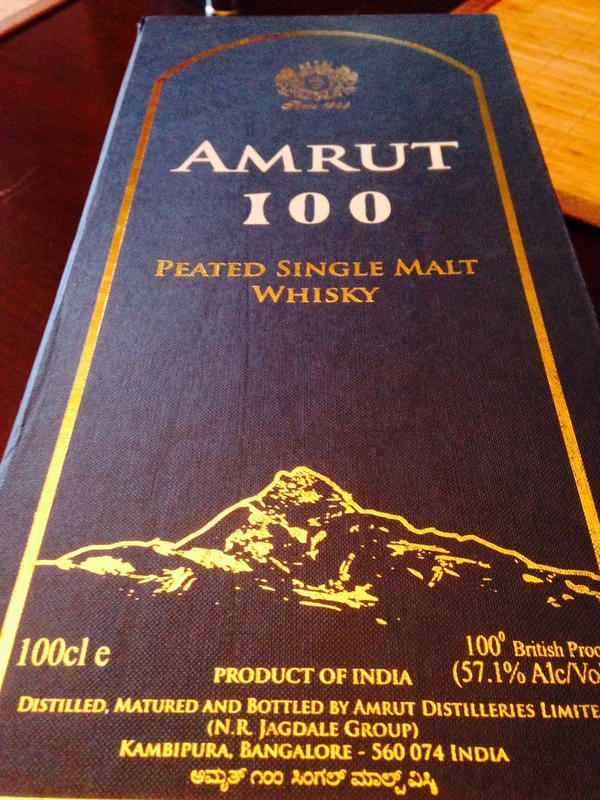 So why did Amrut seemingly give themselves 100 for this extremely rare bottling? Firstly each bottle was exactly 100cl or 1 litre. Bottled at 57.1% which equates to the old British Proof of 100. After aging in ex-bourbon casks the whisky was poured into hand crafted 100 litre virgin oak barrels for a further period of fast aging. Given the conditions at 3000 feet above sea level in Bangalore and the small 100 litre barrels the impact on the whisky was immense. The additional touch was to only release 100 bottles into any given market. The expression I have is batch number 1. Utilizing Scottish Peated Barley sourced from Inverness, the single malt could have ended up as the Amrut 46% or Cask Strength Peated versions we have seen in Canada. However, the very best casks were siphoned off to be turned into this amazing expression. One of the fantastic aspects of Amrut is the ability to age whisky extremely fast and so try all sorts of fun variations with amazing results. Tasted in a Speigelau whisky tumbler. Colour: Rich pale ale red with golden hues. Nose: Sweet and savory like maple glazed smoky bacon. Enticing nose for 57+ percent and not at all nostril searing as you might expect from a whisky packing such high alcohol. Palate: Soft enveloping peaty tones underpined by sweet hickory smoke and just a touch of high cocoa dark baking chocolate. Finish: perfect marriage of that soft peat and smoke outlines a steady concentration of burnt toffee and dark fruit cake. Water: Brings the peat to the surface and is like salty and sweet beef jerky – the kind you buy from the service station on a long road trip. Super soft on the palate with the extra alcohol completely balanced. Far more delicate now toning down the smoke and peat and allowing softer fruits to take over. Almost like drinking two completely different whiskies. Which one would be up to my mood on the day with perhaps a slight tendency to add the wee splash. This is another fantastic experiment from Amrut that paid of handsomely. Such an amazing climate, elevation and skill combination to be able to produce whiskies of this complexity in such a short time. 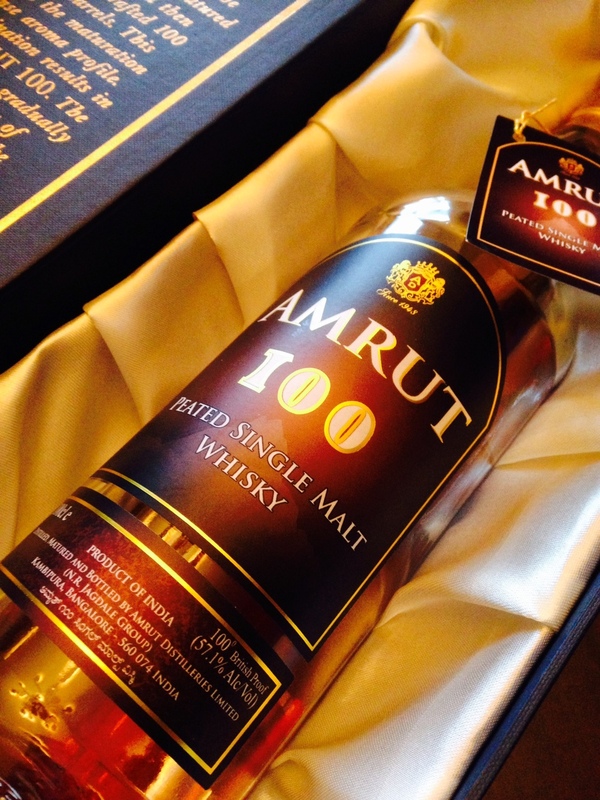 If you get the chance to grab any of the further editions of Amrut 100 I would jump at it quick. This belongs in every whisky lovers collection. I’m down below what even marbles will help with now so might have to knock it off this year. Thanks Ashok for this treasured bottle I will always cherish the time I spent championing Amrut and the amazing whiskies this distillery produces.